You know how pregnant women often have luscious, glowing hair and amazing skin? That’s because while you’re pregnant, the estrogen levels in your body are very high. As it turns out, estrogen has a direct relation with hair health, growth, and how much hair we shed. As you near menopause, your estrogen levels begin to plummet. Around this time, a lot of women start noticing their hair thinning—sometimes quite rapidly. Before you get alarmed, though, know that this is completely normal. 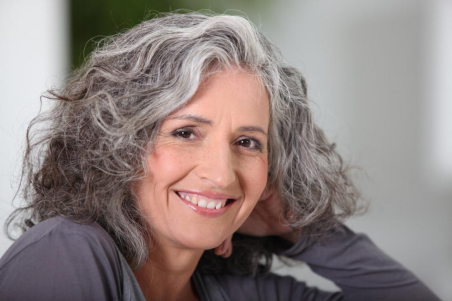 Perimenopause—the stage right before menopause—hair loss is part of aging naturally. High-stress situations are known to cause hormonal imbalances. And when you’re in the perimenopause stage, your hormone levels are already fluctuating. Stress can exacerbate the symptoms of perimenopause hair loss, causing your hair to thin even beyond its natural trajectory. Cutting the stress out of your life is a great way to fight menopause symptoms and slow down hair thinning. Find something that works for you; it could be as small as a stress ball or maybe it could involve physical activity like yoga or cardio. It’s also important to tell your family about the changes you’re undergoing so they can be mindful about not causing you any unneeded anxiety. Post-menopause, your bones can lose a lot of their density and you become a lot frailer in general. It’s already vital that you start making healthy changes in your life at this point. But did you know that doing so can also slow down and even halt the hair thinning process? Drink at least 8 glasses of water a day to stay hydrated, and introduce green tea, vitamin B6 and folic acid supplements, walnuts, salmon, flaxseed oil, etc. into your diet. You may even want to see a nutritionist so you can identify any deficiencies that might be worsening the hair loss. Certain medications can cause rapid hair loss. Talk to your doctor if you were recently prescribed a medication before the hair loss started. If the root cause of your hair loss is indeed a certain medication, your doctor can potentially provide you with alternatives. If your hair thinning is becoming a constant source of stress and anxiety for you, you may want to consider getting hair extensions or a hair restoration treatment. Full-service hair salons like Hair Extensions of Houston provide premium hair extensions that can make your hair look fuller than it ever has. They also offer Low-Level Light Therapy (LLLT), which uses advanced, FDA-compliant cosmetic lasers which stimulate hair growth. Contact them at 832-717-3626 or book an appointment online!